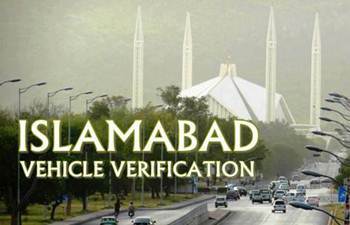 Unfortunately, There is no method to check and verify documents of Islamabad vehicles' online or via SMS. In the past Islamabad had such system but it was suspended later on due to some unknown reasons. The only way is to visit the Excise and Taxation department office or Rescue-15 office to obtain Information sheet of the vehicle from there. Visit Rescue-15 office situated at Sector G-8/4 Islamabad during working hours from 08:00 am to 04:00 pm. Visit with the vehicle and bring original registration book of vehicle and Original CNIC along with photocopies. Get application form from the office of Rescue-15 and after filling the details submit the form at Rescue-15. Experts at R-15 will examine the vehicle and its documents physically and will match its engine and chassis no with their available computerized data. Fee for vehicle verification report is Rs. 300. It is dire need of people to have access to online verification of Islamabad registered cars and other motor vehicles as people all over Pakistan preferred to buy cars with Islamabad Capital Territory (ICT) number plates. So sometimes a buying/ selling deal of such vehicles may take place in a city far away from the capital city of Islamabad. So in this case it is hard for people, who want to buy an Islamabad numbered car, to physically travel to Islamabad just to check and verify the data. So we will also request to authorities on behalf of our valuable visitors, to launch an SMS or Online vehicle verification service for the ease of public. We will update this page as soon as we get information about the availability of online vehicle verification service of Islamabad or at least verification over SMS. In the meantime you can check data online of any vehicle registered in Punjab, Sindh or KPK.